The author brings up an interesting point as the premise of his collection. He contends that all authors are playing God. And there is quite a bit of truth to that. Authors create environments, create characters, and then direct these characters as they go about the storyline. While this is probably true for all fiction writers, Ian Brazee-Cannon possibly embodies this more than most. His warped, macabre, and unusual visions are reflected in his many stories and poems. He sees the world perhaps differently than most, and he uses his pen to address his views. One thing which makes this collection different is the extremely personal narrative which accompanies each piece of writing. Brazee-Cannon goes into detail what he was thinking, what were the circumstances, and what he was trying to say when he wrote each one. The stories range from the unsettling, as in Dominoes, to the humorous, as in Renee of the Sacred Order of Our Lay of Bloody Vengeance, to the thoughtful, as in The Choice. Some stories work better than others, but as the stories cover a long period in time in which they were written, this is hardly surprising. Brazee-Cannon grows in skill as he writes. Not much in these works goes according to the norm. The author skewers convention and goes his own way. One of my favorite pieces, The Words of the Prophets, is a good example of Brazee-Cannon taking on what is a staple of so many fantasy works. This collection is for those who like something a little off the beaten path in writing. If you also have a somewhat twisted view on the world, then I think this collection is for you. 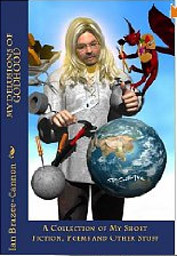 For more reviews or to buy My Delusions of Godhood from Amazon.com, click here.